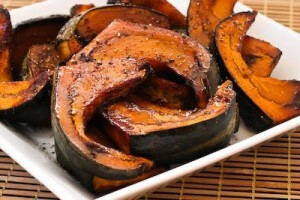 It’s fall/winter squash time… and the buttercup squash is one of my new favorite squashes. I has lots of “meat” , a smaller seed cavity and very tasty. It can be used either savory like this recipe or sweet like for making pies. By now most of you know how much I live Balsamic vinegar so this recipe should not surprise you; and this summer at our market I discovered Agave nectar. Simple Traditions Bulk Foods, one of our local vendors at the farmer’s market, they carry this product. I was using it in salad dressings and in a tea recipe I received from them and thought I might try it on some squash…pretty good if I do say so myself. 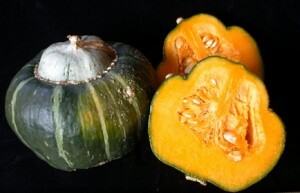 This is one type of our buttercup squash.